Tickets are now on sale for Shropshire Drama Company’s (SDC) forthcoming production of William Shakespeare’s Henry V at Theatre Severn, which takes place from 07 to 10 November. Young King Henry wages war on France. Tainted by the past crimes of his family and with enemies among his own ranks, he must face the difficult responsibilities of kingship, uniting his country and rousing his troops to battle at Agincourt. Young King Henry wages war on France. Tainted by the past crimes of his family and with enemies among his own ranks, he must face the difficult responsibilities of kingship, uniting his country and rousing his troops to battle at Agincourt. A heroic coming-of-age story and a work of stirring patriotic oratory, Henry V also has darker undercurrents that ultimately question the price of military victory and the difficulty of maintaining future peace, something that resonates with the current end of WW1 commemorations. Performances start at 7.30pm in the Walker Theatre at Theatre Severn and tickets cost £17.50 and £15 for students (Wednesday and Thursday only). A discount of £1 per ticket is available for block bookings of ten or more people. To book tickets contact the box office at Theatre Severn – telephone 01743 281281 – or alternatively book online at www.theatresevern.co.uk/shows/drama/henry-v/. 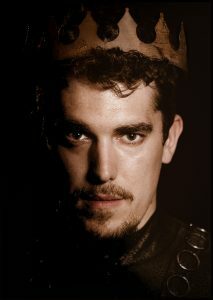 Picture: Alex Beechey as Henry V.